We are pleased to announce that Caterer Goodman Partners has been chosen as a finalist for the Australia China Business Awards for 2013. We have been recognized not only for the strong success we have achieved in developing our expatriate client base, but also the approach we have chosen for our business model, in aligning the interests of our clients and our professional financial advisors. 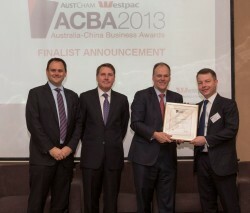 Our founding Partner Owen Caterer was in Beijing on May 9th to accept the finalist nomination from the Andrew Whitfield, China CEO of Westpac Bank.